Modern electronics and quirky souvenirs give this high-tech, masculine office unmatched personality. It’s so St. Louis. 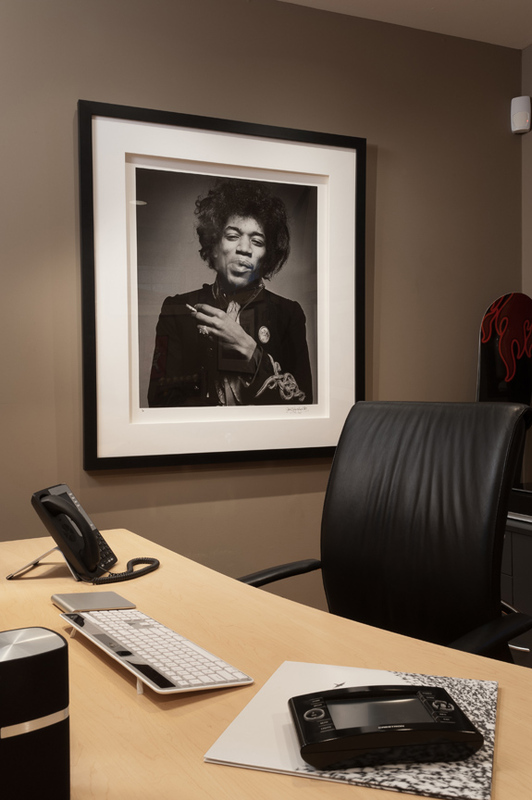 Hometown sports memorabilia and unexpected collectibles deliver character to a basement office exhibiting the latest in innovative home automation technology. In honing his space, the ultimate man cave, Walbrandt Technologies owner Aaron Walbrandt achieved the perfect synthesis of sophisticated and simple by merging new with old to create an uber functional after-hours workplace. “Any small business owner knows the workday doesn’t end at five” says Walbrandt. In a demanding era of iPhones and cloud technology, Walbrandt needed a practical homestead hideaway for all his off-the-clock tasks. That’s why, when designing a modest basement home office, Walbrandt opted for simple colors, fun décor and a mix of standard and cutting-edge technology. All the basics are present and accounted for: computer, printer, landline phone and fax rest atop a spacious maple desk with a soft, voluptuous curve and industrial metal legs. The desk, like the technology it holds, is a fusion of classic and contemporary. Walbrandt’s affinity for music and sports vitalize the space, adding depth and color to an otherwise neutral palette. The color scheme, like the décor, is virile; khaki walls and a beige sound-absorbing cork floor submit to Walbrandt’s prized, mostly local mementos – framed albums, Brett Hull and Wayne Gretzky hockey sticks, even a guitar signed by The Flaming Lips that Walbrandt scored at The Pageant. A Rams football helmet and autographed bats from recent Cardinals World Championships are carefully arranged on the bookshelf. Nearby, a pair of Matt Holliday’s cleats sparkles beneath recessed lighting. Walbrandt refers to the space as “a mini-museum of stuff my wife doesn’t want lying around the house” – which, perhaps, is how this particular home office, an otherwise ordinary room, has evolved into a space that’s every bit as personal and charming as it is functional.